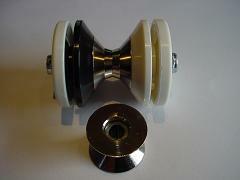 Bearing axle set (wide axle) for the Fly diabolo. Use to convert your fixed axle fly (steel axle) to a bearing diabolo or as a spare axle for your bearing diabolo. 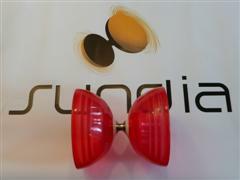 Simple to fit - just remove the cups from your diabolo and fit them to this axle set. Set includes bearing axle bolt and axle (silver copper), hubs (1 Black & 1 White), washers & nuts.